A team of close to 50 scientists, students and technical staff is bringing an unprecedented assembly of equipment to Vale do Cobrão, a valley in eastern Portugal. Researchers at the valley are collecting data on multiple aspects of wind flow patterns shaped by meteorological forcing on intricate terrain through carefully planned field observations. 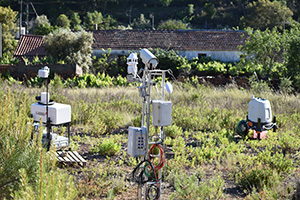 Field work on this project, called Perdigão in recognition of a town close to the valley, began May 1 with intense data gathering of measurements including velocity, turbulence, temperature, moisture and radiation. Vale do Cobrão stretches out beneath two near parallel ridges. At the surface is a mixture of farmland, vegetation, canyons, gullies and a river. The pulp and paper industry makes use of the patches of eucalyptus growing nearby. The wind flow is typically perpendicular to the ridges and can reverse, at times building to powerful gusts. All of this makes for a unique scientific study. The United States and the European Union have expressed interest in increasing wind energy shares of their respective total energy consumption. The U.S. hopes to increase its share from 6 percent to 20 percent by 2030. The EU hopes to see wind energy at 25 percent, up from 16.5 percent currently, by the same year. Doing so will require updated models for a more detailed and accurate understanding of wind flows in natural settings. As part of the project, researchers will map out the flow field in greater detail using improved models and fundamental understanding based on the new data set and analysis. Along an estimated four-mile-long, one-mile-wide swath of the valley, researchers have set up an intricate array of instruments including approximately 50 flux towers, ranging in height from 10 to 100 meters, equipped with sonic anemometers to measure mean flow, turbulence and fluxes. Thermistor arrays, microwave radiometers and an atmospheric emitted radiance interferometer measure the temperature structure; LiCOR systems measure CO2 and water vapor while radiometers measuring the incoming, outgoing and net radiation. Remote sensors such as sodars, lidars and wind profilers have been set up to capture flow and turbulence, and four to 16 radio soundings are deployed every day to map the atmospheric structure in and above the valley. Additional equipment will track fine-scale turbulence, pressure perturbations, lower atmospheric meteorological profiles and even acoustic levels. When completed, scientists will have a reference data set of incomparable spatial resolution. The research will aid wind resource assessment in Europe and elsewhere in the world and optimization of wind-turbine siting, as scientists will make use of an existing full-scale turbine at the Perdigão site to study the interactions of turbine wakes with varying wind flows and topography. Data gathering will continue until June 15. Antecedent wind monitoring for the project with limited equipment started earlier, in mid-December 2016. The University of Colorado Boulder is co-lead of the project. The U.S. group includes researchers from Cornell University, the University of Oklahoma, University of California Berkeley, and the Army Research Laboratory. The National Center for Atmospheric Research’s Earth Observing Laboratory is responsible for the overall coordination of the campaign, including the provision and operation of a large array of scientific sensors, and the delivery of scientific data and logistics support. Originally published by Jessica Sieff at news.nd.edu on June 01, 2017.